I first learned about VMware at University doing an internship in Spain as a Systems Technician. I was very much into networking and I got amazed what possibilities virtualization could bring and I made me to make a change in my future career. I decided to do my thesis on Servers Virtualization. No one was really interested in it at that timeJ. I haven’t really planned to do VCDX. I always found VMware exams very challenging comparing to other Vendors. Having VCP certificate few years ago was an achievement. 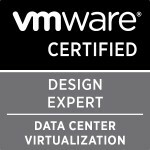 When I did my first VCAP I understood I can actually do more, but still did not think about VCDX as an achievable goal. There were less than 200 people in the world with that accreditation! When I got my second VCAP I thought, “OK, let’s do it”. Well there are 2 things actually. One is the time I needed to get proper experience and second is the time to prepare and pass all exams. I believe you really need to have Enterprise experience to pass VCDX as it is not only about technology. Thankfully, I always worked with big customers in Atos so it was a natural process for me. I believe it took me minimum 2 year to pass all the exams. But I would not be able to make it if I did not get the hands-on experience in the first place. There are few things. First, stop thinking that there is any limit to what you can achieve. Second, take small steps. Third, understand that VCDX is not only about technology. Fourth, know EVERYTHING about you designs. Fifth, do mock exams with people that can really challenge you. Last but not the least, find a Mentor. I will not lie. VCDX journey took part of my private life away and you really need to take it into account. I did and I actually took some weeks of holidays just to concentrate only on VCDX. However, I would not really do anything differently. I took every opportunity to prepare and learn about the program. We had lot of on-line mock exams with my peer Krzysztof – invaluable. I also prepared myself mentally for the exam and possible result. I wanted to pass it in first attempt but I thought if I don’t then I am not there yet. It allowed me to accept both scenarios and get confidence. Getting my application accepted was already a big achievement for me so I really felt like on a cloud nine! When I got a phone call from my peer in the morning saying ‘results are out, I passed!’. I set in front of my laptop, browsed my mails and found out that I was VCDX #211! That was a day I had champagne for breakfast! (Btw. I was on my annual leave at that timeJ). I still think that VCDX is not as recognizable as it should be. We did get a lot of recognition from colleagues that understand what VCDX is but I guess it will take some more time for people to understand the real value. So was it worth? – yes definitely! The thing that I was most happy about was that I did stand in from of the panellist and I did defend my own design! I would definitely do it again just for this experience! Btw. I would like to thank Krzysztof Hermanowski for all the time spent late evenings doing mock exams. Artur Krzywdzinski and Magnus Andersson for all the useful tips I got. AtoS colleagues for all the support. Also all guys from the Study group. Categories: Certifications, VCDX, Virtualisation, VMware | Tags: VCDX, VCDX Spotlight | Permalink.